'After Obama, Netanyahu finally has a real friend in the White House,' says former US Ambassador to the UN, John Bolton. Former US Ambassador to the United Nations John Bolton praised President Trump’s handling of the US-Israel relationship, telling Arutz Sheva that after a chilly relationship with Trump’s predecessor, Barack Obama, Prime Minister Binyamin Netanyahu finally ‘has a real friend in the White House”. Speaking with Arutz Sheva during the 35th annual American Friends of Bet El dinner in New York, Bolton responded to reports that President Trump was weighing a major shift in US policy regarding Jerusalem this week, and is planning to either announce the relocation of the US embassy from Tel Aviv to Jerusalem, or making a formal statement recognizing the city as Israel’s capital. Recent reports have claimed that the president has pushed for the embassy move, over the opposition of senior officials who have warned of an Arab backlash. 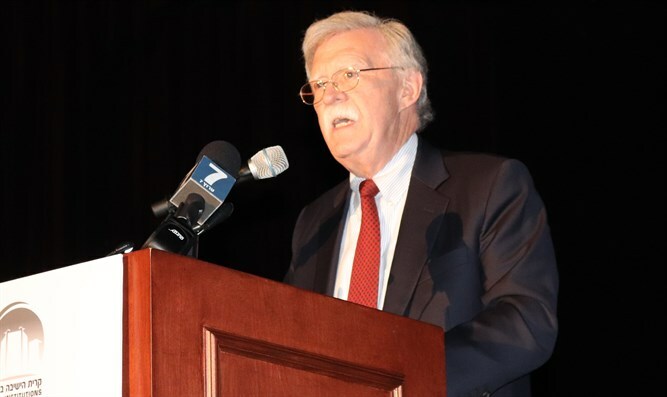 Bolton said Trump’s “heart is in the right place on this,” arguing that the State Department is largely responsible for blunting the president’s desire to follow through on his campaign promise to relocate the embassy. With a December 4th deadline for extending the security waiver that allows the US embassy in Israel to remain in Tel Aviv, some senior US officials have claimed that the president may again delay the embassy move, and instead recognize Jerusalem as Israel’s capital. Even if the president declines to move the embassy, Bolton told Arutz Sheva, recognizing Jerusalem as Israel’s capital would represent a sea-change in American policy towards Israel. The former ambassador added that President Trump was a “real friend” to the Jewish state, in stark contrast to what he called the “difficult times” of the Obama administration’s relationship with Israel.